- Ripe fruit are fragrant and give, slightly, to the touch. If they are a under-ripe, leave them at room temperature for 2–3 days to ripen. Look for fruit with smooth unblemished skin. Avoid extremely hard or dull colored fruits and soft fruit with soft, wrinkled, punctured skin. - Nectarines keep for 5 days if stored in a plastic bag in the coldest part of your refrigerator. 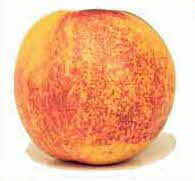 - Nectarines can be used and prepared in the same ways as peaches, with no need to peel because they have no fuzz. Leave the skins on when making pies, cobblers and fresh fruit salads, etc. - California nectarines are available from late April and to late August. Almost all of the nectarines available are in California. Chiliean Nectarines are available from late December through early March. Bake peeled, halved, pitted fruit, cut-side up in a baking pan sprinkled with honey and cinnamon and cooked until tender. Grilled nectarines are a wonderful tasty treat! Be sure to brush the fruit with fruit juices and cook until it is heated through. Poached nectarines in fruit juice or wine and cook until tender…a simple, elegant way to end a meal. Nectarines make a good substitute in any recipe that calls for peaches or apricots. Serve pancakes, waffles, or French toast with sliced or chopped nectarines. Add cut up nectarines to your favorite fruit salad. Serve baked nectarines with baked chicken or ham as delicious side dish.